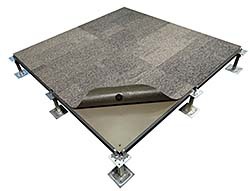 PosiTile carpet tile is sized to match one-to-one with the company's ConCore access floor panel. Four ultrasonically welded buttons on the underside of each tile align with four matching holes in the ConCore panel, eliminating the use of glue. A partnership with Interface integrates a broader array of carpet styles and options into the offering.